The light was filmy, and the woods around me positively technicolor. Elaborate spider webs lay untouched and moss grew wild. I half expected a gnome to jump out and yell, gotcha. 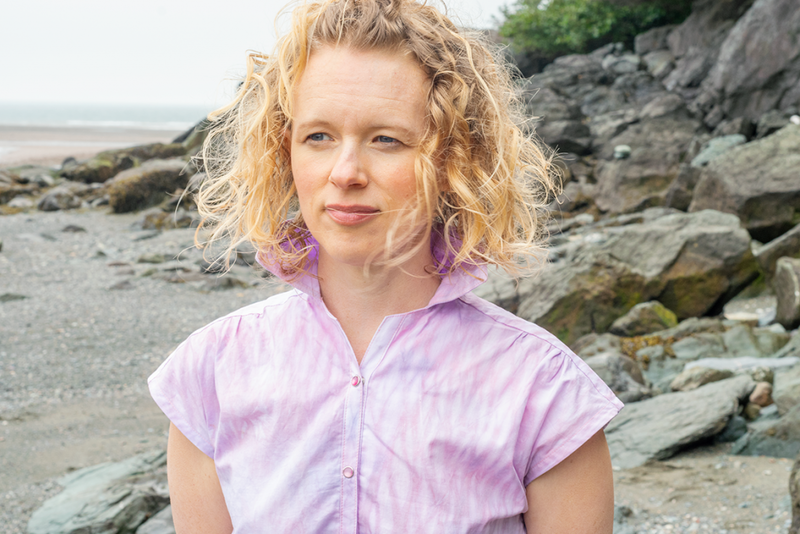 It was not the place that I first imagined my Sew Over It Penny dress in this rather tropical Lady McElroy fabric to take a walk, but a couple weeks back, as my husband and I explored The Haunted Wood at the Green Gables house on Prince Edward Island, that’s exactly what happened. Okay, so it wasn’t that dramatic. But still, it’s not everyday my handmade garments get to have such a moody backdrop. Usually, the most common place my handmade garments find them is in the driver’s seat of my minivan with my crew to soccer practice in probably possibly in the form of my latest pair of crazy jams. It’s pretty easy to see how these woods inspired L.M. Montgomery’s imagination as she wrote Anne of Green Gables. It was too cool to get to take pictures in such a place–the inspiration itself for one of my favorite books of all time. Dude–this dress?! I wouldn’t wear puffed sleeves, but THIS dress!!!!! But let’s get into my dress itself. I was totally taken by this Lady McElroy lawn. Last year I had seen Lauren Guthrie make it up into a project and instantly loved the peachy pinks. I may or may not have stalked this fabric for a while on about every website possible, trying to justify the price + the crazy expensive shipping from the UK. As it turned out, Fancy Tiger stocks it which saved me a buttload in shipping plus the chance to see it in person. This is really lovely fabric. It’s crisp and has good structure, making for a proper popped collar, yet it has a hand that’s nearly as lovely as a silk cotton blend. While it wasn’t cheap at $22/yd, this dress only took up 1 1/3 yds with my modification on the skirt. 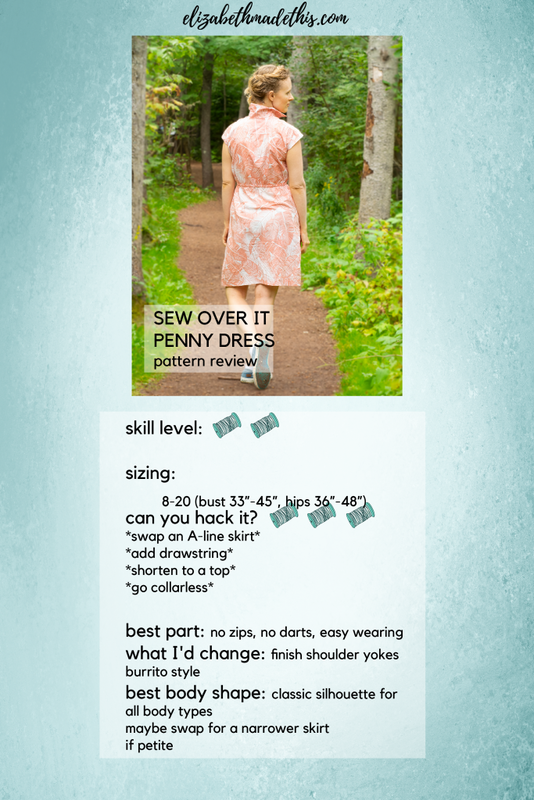 Just like on my shibori dress, I narrowed the skirt for this version of the Sew Over It Penny dress. I think half circle skirts look great on other people, but they always feel like far too much fabric for my frame and height. This slightly A-line skirt I added from my self-drafted pencil skirt is just the right amount of sweep at the hem for me on this one. Because I’m like the Princess and the Pea with elastic, I added the drawstring. To do so, I added 2 tiny buttonholes on either side of the center front at the bottom of the bodice. The drawstring is threaded through the casing then. A full elastic waist is perhaps the most uncomfortable thing to me, plus I love how a drawstring is a built-in belt and that I have the option of tightening or loosening it. With a sewn-in elastic waist you don’t have that option, plus you’re probably adding a belt to add some waist definition. In terms of the actual sewing of the dress, this is pretty easy sew. There’s no darts or zippers, though there is a collar. I think this would be appropriate for any beginning sewist who’s ready to tackle putting in a collar. There’s no collar stand which requires more precise stitching, and the facing makes for a really clean inside. Shoot, you could make it collarless and make it even easier. The dress has a great silhouette to it, and I think there’s very few body types it wouldn’t work for. Maybe consider narrowing the skirt if you’re petite like me. Otherwise, this has a great classic look and super easy to style with a jacket, cardigan, tights, whatever!! For all the loveliness of this pattern, I have a serious beef with the shoulder yoke. For some reason, the directions would have you leave all of the seam allowances just serged/zigzagged off on the inside. How would you sew it: Per the pattern directions (left) or with a clean finish burrito style (right)? A clean-finish yoke like what you’d see on the inside of a RTW men’s shirt is SOOOOOOO much nicer and really doesn’t require a whole lot more in terms of the construction. Sometimes rough inside finishes get the job done quickly, and that’s totally okay. In this instance, why you would choose to skip a clean finish is a mystery. But that’s one of those things. Sometimes you follow the directions to the T and you move on. On the other hand, when you’ve done something a certain way, you have an opinion about it. If you like the way to construct something better than what’s in the pattern directions, make it the way you like. The pattern police won’t come and get you! Are you a follow-the-instructions type, or do you go your own way when you sew? You know what’s awesome about dyeing fabric? It’s so absurdly low-tech, and yet the possibilities you have to create interesting effects are infinite. Shibori dye has been on my DIY bucket for a while now, so when LA Finch Fabrics approached me to review their PFD Organic cotton shirting, oh, and dye it, I had to jump on that train post haste. I give you my shibori dye Sew Over It Penny dress! PFD fabric is “prepared for dye”. It’s a totally blank canvas for all your diy love. Because this is organic fabric, it’s an excellent candidate for natural dyes like indigo or turmeric. Working with indigo remains one of the few dye techniques I’ve not tried! With the popularity of mustard colors in fashion this Fall, dyeing this fabric with turmeric could be a really cool project. Hey it would go with this bag! This fabric is a 100% cotton shirting. I would say it’s about the weight as a good quality 100% cotton shirting you’d see in a ready-to-wear men’s shirt. This fabric was made for a beautifully structured collar! Shirtdresses like the Sew Over It Penny dress or a nice button down shirt pattern like the Grainline Archer are both great choices for this fabric. If you’d like to experiment with this lovely fabric, LA Finch is offering it for $5/yd right now! Here’s what I did with it. Shibori is the traditional Japanese art of dyeing fabric. It’s a resist technique not unlike tie-dyeing. Resist dyeing means that you add something to the fabric that prevents the dye from making a nice even color throughout. In the case of shibori, the fabric may be folded, twisted, pleated, wound with string, stitched, clamped in any number of configurations before the dye is applied. The variants are infinite and there is definitely art and a lifetime’s worth of study to truly understand how to make what with shibori. If you’re looking for a good intro, I found this book to be a good primer with some practical projects. After several experiments, I settled on the Arashi form of shibori which involves dyeing with a pole. Anytime I get to go to Home Depot to start a sewing project, I’m pretty excited. I used to hate home improvement stores as a kid, but now, I kind of love it. It makes my home nicer, they have GIANT carts that make my kids happy, and the happy color chips of the paint section could occupy me for hours. On this particular visit, I picked up a large chunk of PVC. I almost walked out with a 15 foot pole, but I did see a smaller 3′ chunk that was much easier to manage. You do want to have the biggest diameter pole you can get which will make sense in a minute. This one has a diameter of 3″. The basics is that you wrap the dry fabric around the pole. You can do this on an angle or not. When you run out of pole, you scrunch the fabric down until it can scrunch no more. What you’ve done is created tons of micro pleats in the fabric. If you try to do this with too much fabric, it’s going to be really unwieldy to scrunch. You know the thing about you can’t fold a piece of paper more than 7X unless you’re Hulk? The same thing applies here. For this midweight fabric, I found sections of 1.5 yards just about perfect to work with. Also, the large diameter pole makes it easier to compact down the fabric without it becoming loose and too hard to handle. After you scrunch everything, secure the fabric to the pole with as many rubberbands as you’d like. The tighter they are, the more the fabric folds and the rubberbands themselves will prevent the dye from being uniform. You can add some clips if you like for more resist texture. Next you wet the fabric. Then you dye the fabric. I used two different colors–one pink, and a darker purple. The purple is actually a darker version of the pink. You can apply the dye uniformly or in stripes or at random. This is definitely something that warrants experimentation, and no 2 pieces of shibori are going to look the same. I’ll also throw out there that I was using the dye I had on hand: Rit DyeMore in a couple different colors as well as regular Rit Dye. Some day, I will break down and buy some fiber reactive dyes. My understanding is that you’ll get more intense colors with them. After letting the dye soak into the fabric for a few hours, you can unwrap it all. Pull off the rubberbands and unroll the fabric. As it’s wet, it’s going to be rather difficult to deal with. You will get to see all those cool pleats you made! My sons have dubbed this pattern “fish skin”! That definitely felt appropriate for the dramatic backdrop of the Bay of Fundy in New Brunswick, Canada which my husband and I got to visit for a belated anniversary trip. After this, rinse the fabric with cool water until it’s clear. If you like, you can toss it in a cool water cycle in your washing machine. After that, you’re good to go. With my fresh shibori dye fish skin fabric, I was ready to sew it up into a Penny dress. For my version, I swapped out the giant circle skirt for a straight skirt which is definitely more my style. I also finished the armholes with bias tape I cut from a striped cotton shirting. The shoulder yoke is lined burrito-style. For some reason in this pattern, the directions would have you finish the shoulder yoke seam allowances and have them just hanging out along the shoulder edge on the inside. The burrito method is definitely a cleaner finish. The yoke on the Penny is much smaller, so it’s a little harder than a traditional button down shirt, but the principles are the same. I also skipped the waist elastic in favor of a drawstring. To finish up everything, I added some coordinating pearl snaps. So that’s the tale of my shibori dyeing exploits. I reckon this is a deep rabbit hole, and I’m really looking forward to trying this out again. Thanks to LA Finch Fabrics for giving me the fabric! Have you tried shibori dyeing? There’s been so much feet dragging with my Make 9 this year, and the Sew Over It Lulu dress has been partly to blame. I saw the lack of darts and waist shaping and thought there was no chance it’d work on my pear shaped self. Guess what? I was totally wrong. There’s no zippers or buttons or darts to sew in this pattern! What? What a rare bird among woven dress patterns! I have a friend who’s terrified of buttonholes and zippers of all kinds, so this pattern would be perfect for her. And because there’s none of these things, this dress sews up pretty quickly. The only thing that might be intimidating for a beginner is the facing for the keyhole. But the instructions are good on this point. As far as pattern hacking goes, there’s a couple of good options. You could use a contrasting color on the sleeves for a little colorblocking. You could even take off the sleeves entirely, bind the sleeve holes with bias and make a tie neck as a neck binding for a summer halter. For me, I used this striped cotton shirting from Cali Fabrics. The stripes are actually 60 degrees to the straight grain, so while it looks like I put the stripes on the bias, they’re actually on the straight grain. Sneaky… To get the alternating stripes, I didn’t cut the front and back on the fold. Instead, I cut 2 fronts and added a seam at CF and CB so I could alternate the pattern. It took some time to cut this right so that the stripe matching could work. I even managed to mess up the right side on one of my sleeves and had to take it apart and re-sew it. Still, it wasn’t too bad since this is a pretty simple pattern. Because there aren’t any darts and this has a pretty loose waist, I think Lulu could benefit from some extra styling. I myself am a pear shape (A shape! ), and without any waist definition, I do not feel particularly polished. You might find yourself in the same position if you have more of an hourglass (you lovely X shapes!) silhouette. So what do you do dear? Cinching loose waists is not a cure all, but in this case, it really does help. I tried a pashmina and a simple fabric belt and liked both. This is a style you might not be able to find, but an asymmetric cowl sweater is easily crocheted. I bought mine from a woman in Sew Much Talent, but check out this tutorial if you crochet or this quick sweater refashion from See Kate Sew. The asymmetry adds a little more waist definition to the Lulu, and it’s a good addition for layering for the coming cooler months. Mine is open on the sides, so I’m holding it together with a kilt pin! Name one outfit a jacket doesn’t make better. I paired my very tough looking Rose Tyler jacket for a purple explosion. Any other jacket or even a cardigan would work well too. For me, my shoulders get lost in the raglan sleeves, so the jacket helps me remember where they are. Plus, it’s cool. Wear a jacket. Look cool. The end. I know Sew Over It has been popular for a good long while now, and I finally get it. Cute styles, easy sewing, and at the end of the day you feel pretty great. While this won’t be my go-to pattern, it was good to try something outside of my style comfort zone and explore how to make it work for my body type. 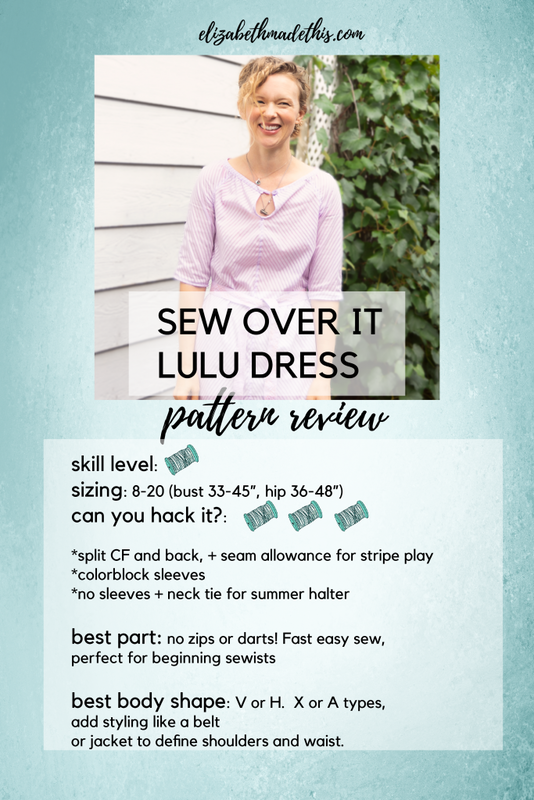 Have you tried the Sew Over It Lulu or another Sew Over It pattern? How did it go?